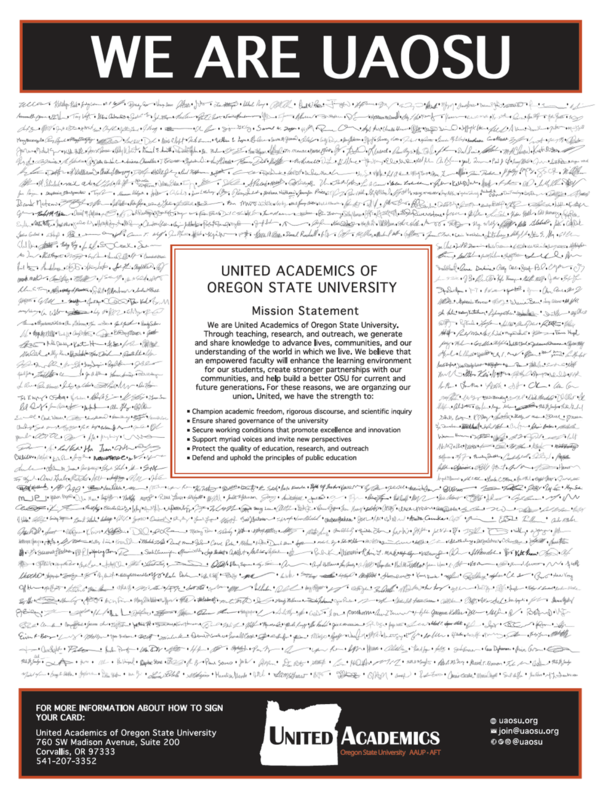 Last academic year a strong majority of faculty members signed authorization cards for the certification of our union, UAOSU. Now that the Employment Relations Board has certified our union, it is time for our membership drive. Signing a union membership card means you can actively shape the direction of our union. As a member, you can vote on the constitution, bylaws, elected leadership, collective bargaining agreement ratification, and dues rates. Being a member also means joining a community of OSU teaching and research faculty, and a community of faculty across the nation through our affiliates, the American Association of University Professors (AAUP) and the American Federation of Teachers (AFT). Please consider becoming a member by signing a membership card. Faculty with limited supervisory authority are still working on collecting authorization cards for their bargaining unit. For more information, click here.